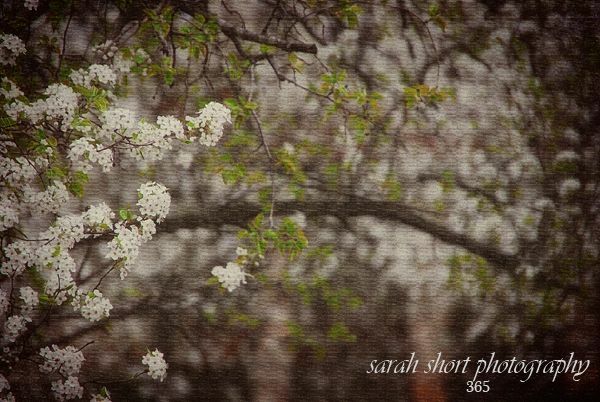 *The Bradford Pear trees that line our back fence bloomed this week. They are absolutely beautiful. They are beautiful. What a big difference a 6 hours south makes from where I live. We won't see sights like that until mid-April. What a gorgeous shot! The shadows and texture of the fence really adds to the beauty of the blossoms. Saw some gorgeous blossoms on the trees in Atlanta this week. It was so wonderful to get out of the snow. Can't wait for spring back here in Michigan. Winter has gone fast, but now the long wait until springtime. I love flowering trees. We have too many deer here for them to survive, though. What a beautiful picture, Sarah. The effect is interesting, too. Photoshop fun?